Artist Alan Dawson grew up in Elgin, was educated at Elgin Academy, and then Aberdeen University, where he studied Law, and then Accountancy. He first worked as a Solicitor in Edinburgh, before beginning full time work as an Artist in 1994. He opened The Quay Gallery in Aberdour, Fife in 2006. Known in particular for his range of architectural montages and stylised semi-abstract landscapes, Alan was invited last year to create a montage of Pluscarden in aid of the Pluscarden Abbey South Range Appeal Fund. As he later commented: “There is such a wealth of beautiful detail and fine architecture here that the project was impossible to resist. It is such an interesting mixture of the very old and very modern. So much colour and vibrancy in such a calm and peaceful place. It was a challenge, but one I would enjoy”. A limited edition of 200 high quality signed and numbered copies of Alan’s painting have been produced, and may be purchased via the Abbey Appeal Office in Elgin or in the Pluscarden Abbey Shop. Alan has most generously agreed that all monies raised will go to the Appeal. Please contact us (Tues/Wed) at: Pluscarden Abbey Appeal Office, 216 High Street, Elgin, IV30 1BA. 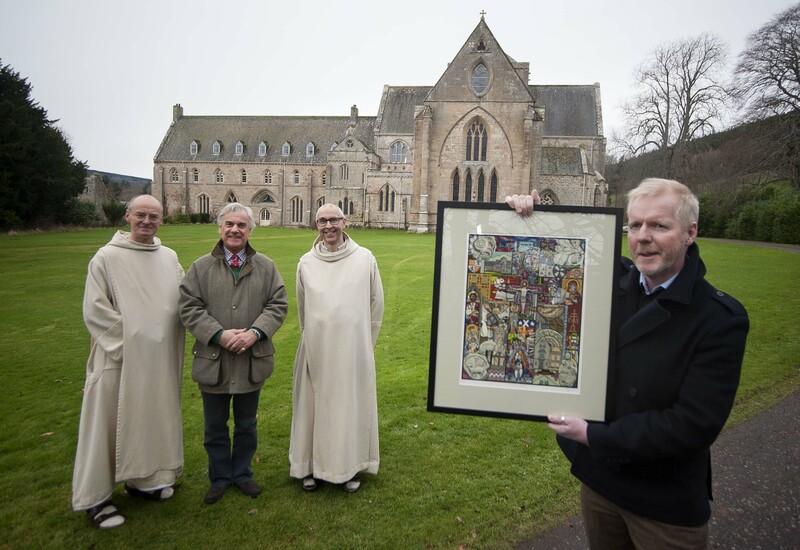 Artist Alan Dawson montage unveils his oil painting celebrating Pluscarden Abbey at Pluscarden Abbey. In the photo, from the left Father Benedict Hardy, David Broadfoot, Brother Michael de Klerk and in the foreground artist Alan Dawson. The photograph is credited to Michael Traill Photography.